"X-Men: Days of Future Past is a 2014 American superhero film based on the fictional X-Men characters that appear in Marvel Comics. Directed by Bryan Singer, it is the seventh installment of the X-Men film series and acts as a sequel to both 2006's X-Men: The Last Stand and 2011's X-Men: First Class. 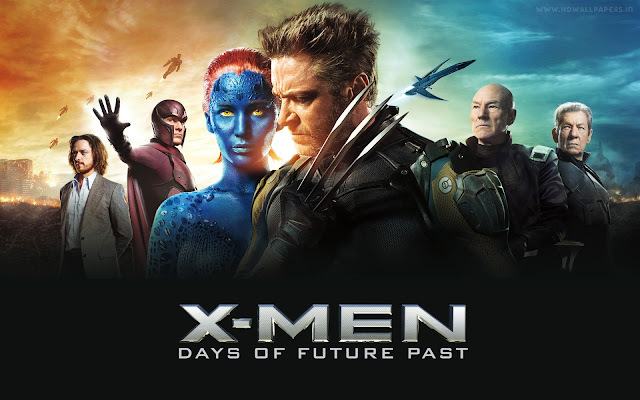 The story, inspired by the 1981 Uncanny X-Men storyline ""Days of Future Past"" by Chris Claremont and John Byrne, focuses on two time periods, with Wolverine traveling back in time to 1973 to change history and prevent an event that results in doom for both humans and mutants. The film features an ensemble cast, including Hugh Jackman, James McAvoy, Michael Fassbender, Jennifer Lawrence, Halle Berry, Anna Paquin, Ellen Page, Peter Dinklage, Ian McKellen and Patrick Stewart. Simon Kinberg wrote the screenplay from a story conceived by himself, Matthew Vaughn and Jane Goldman. With a budget of $200 million, principal photography began in Montreal, Quebec in April 2013 and concluded in August the same year, with additional filming and pick-ups taking place in November 2013 and February 2014. The film premiered in New York City on May 10, 2014, and was theatrically released on May 23. X-Men: Days of Future Past became the best-reviewed film in the X-Men film series, having been praised for its story, visual effects, action scenes, acting and thematic elements. During its theatrical run, the film earned over $747 million worldwide, making it the 6th highest grossing film of 2014, as well as the highest-grossing film in the series until 2016 when it was surpassed by Deadpool. The film received an Academy Award nomination for Best Visual Effects, making it the first X-Men film to be nominated for an Oscar. A sequel, X-Men: Apocalypse, was released on May 27, 2016, with Singer returning to direct, Kinberg writing the script and McAvoy, Fassbender, Lawrence, Till, Peters, Hoult, Helman, and Jackman reprising their roles." "In the future, robots known as Sentinels are exterminating mutants and their human allies. The Sentinels are near invincible as they possess Mystique's powers of transformation. This technology was made possible following research performed on Mystique when she was captured during the assassination of Dr. Bolivar Trask, creator of the Sentinels. A band of mutants, including Kitty Pryde, Colossus, Iceman, Bishop, Warpath, Blink and Sunspot, convene with Wolverine, Storm, Professor Charles Xavier, and Magneto in a hideout in remote China. Pryde sends Wolverine's consciousness back fifty years to 1973 to prevent Mystique from assassinating Trask, which led to her capture and revealed the threat that mutants could pose to normal humans. In 1973 in Washington, D.C., Trask unsuccessfully tries to sway Congress to gain support for his Sentinel program. Meanwhile, in Saigon, Mystique prevents William Stryker from appropriating a group of mutant G.I.s for Trask's research. At the X-Mansion, Wolverine encounters Xavier and Hank McCoy. Xavier, a broken man, has been overusing a serum that allows him to walk but suppresses his telepathy. Wolverine explains his mission and persuades Xavier to help free Magneto from a prison cell beneath The Pentagon, where he is being held for assassinating President John F. Kennedy. They rescue Magneto with the help of Peter Maximoff, a mutant with super speed. Xavier, Magneto, Beast, and Wolverine fly to Paris to intercept Mystique, who is impersonating a North Vietnamese general to infiltrate the Paris Peace Accords. The group arrives as Mystique is about to kill Trask. Magneto tries to kill Mystique to ensure her DNA cannot be used for the Sentinels. Beast reverts to his mutant form and fights Magneto. The whole mission is put in jeopardy when Wolverine briefly encounters Stryker, causing him to go into a frenzy that briefly sends his subconscious back to the future. Kitty succeeds in stabilizing Wolverine's subconscious, but is gravely injured by him in the process. Back in the present, the fight spills onto the street in view of the public, allowing Magneto and Mystique to escape. Trask is saved, but the world is horrified by the existence of mutants. President Richard Nixon approves Trask's Sentinel program and arranges an unveiling ceremony. Trask's scientists recover Mystique's blood from the street. Meanwhile, Magneto—who has recovered his telepathy-blocking helmet—intercepts the prototype Sentinels in transit and laces their polymer-based frames with steel, enabling him to control them. At the mansion, Xavier stops taking his serum and slowly regains his telepathic powers, while losing the ability to walk. Through Wolverine, Xavier speaks to his future self and is inspired to work for peace between humans and mutants once again. He uses Cerebro to track Mystique, who is heading to Washington, D.C.
As Xavier, Wolverine, and Beast search for Mystique, Nixon unveils the Sentinel prototypes at the White House. Magneto commandeers the Sentinels and attacks the crowd, then sets the Robert F. Kennedy Memorial Stadium around the White House as a barricade. Nixon and Trask, accompanied by the Cabinet, Secret Service officers, and Mystique (disguised as a Secret Service member), are taken to a safe room. Wolverine and Beast try to stop Magneto, but he pits a Sentinel against them and then throws Wolverine into the Potomac River. In the future, the X-Men make their final stand as a large army of Sentinels attack the monastery. In 1973, Magneto pulls the safe room from the White House and prepares to kill Nixon and his Cabinet. Mystique, who is disguised as Nixon, incapacitates Magneto with a plastic gun. Xavier persuades Mystique to spare Trask and allows her and Magneto to flee. Mystique's actions are seen as a mutant saving the President, leading to the cancellation of the Sentinel program. Trask is arrested for trying to sell American military secrets. In the future, Mystique's actions save Xavier, Magneto, and Pryde just as a group of Sentinels reach them. Wolverine wakes up back in the future to find Iceman, Rogue, Colossus, Pryde, Beast, Storm, Jean Grey, Scott Summers, and Xavier all alive. He then proceeds to explain to Xavier about his experience. In 1973, Mystique, impersonating Stryker, takes custody of Wolverine, who has been fished out of the river. In a post-credits scene, a crowd chants to En Sabah Nur, who is using telekinesis to build pyramids as four horsemen watch from nearby."